Easter festivities are some of my favorite for the whole year. It’s just such a perfect time of the year. The flowers are blooming, the weather is usually just right, and you get to gather with friends and family for fun festivities. 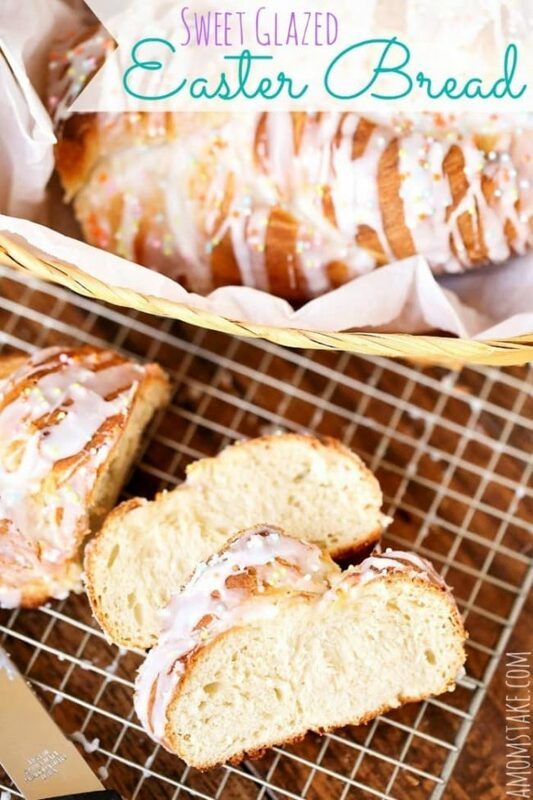 This sweet glazed Easter bread makes a perfect treat to add to your festivities. 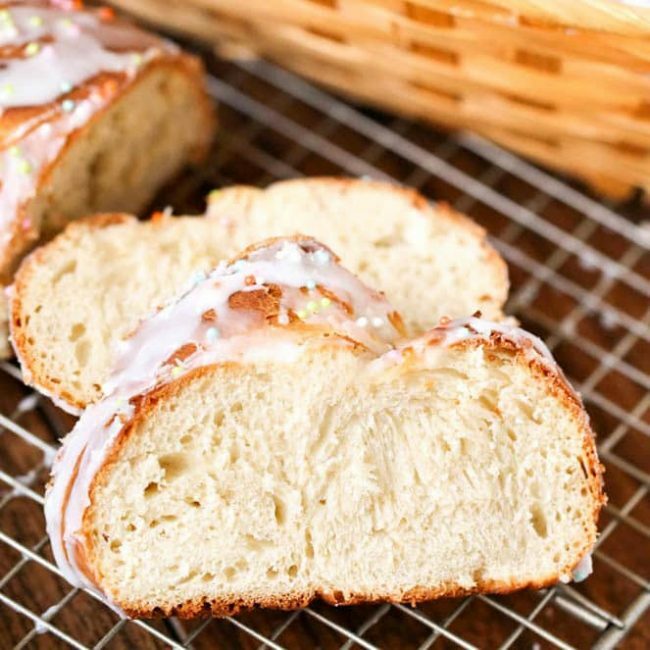 The sweet glazed topping and touch of sprinkles will make this delicious Easter bread a huge hit with your gathering. It’s a perfect Easter side dish recipe or great to use as a dessert. Mix milk and yeast in a bowl. You can warm your milk first and then add yeast, if your home isn’t warm enough for the yeast to rise. Next, add butter, flour, sugar, and salt. Blend well with an electric mixer. 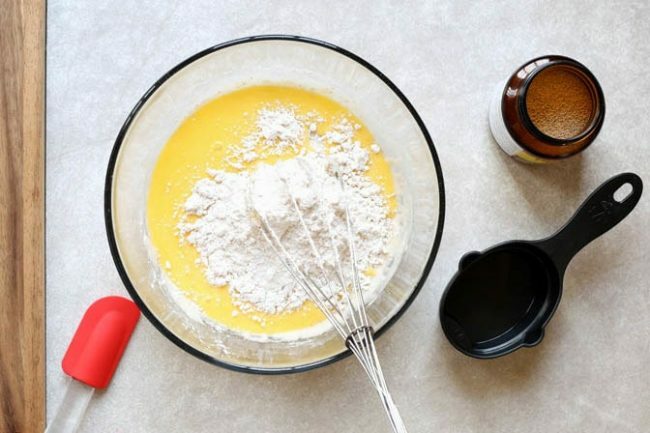 Add eggs to mixture and blend again until a dough forms. Drop onto floured surface and knead for 5 minutes. Roll into a ball, place in a large bowl, and cover with a damp towel. Set in a warm spot and let rise for 1 hour. 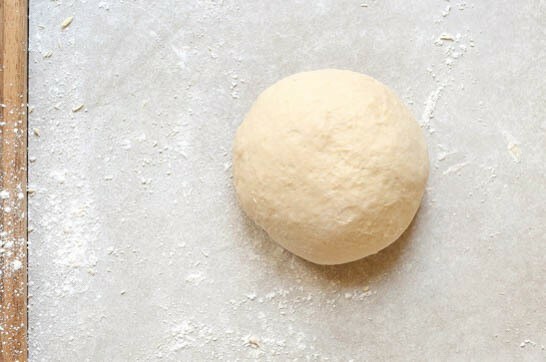 Turn out onto a floured surface, divide into two pieces, and roll each piece into a long/thin dough roll. Twist rolls together and form a circle, connecting the ends together. Bake at 350 for 20-25 minutes. Remove from oven and let cool. 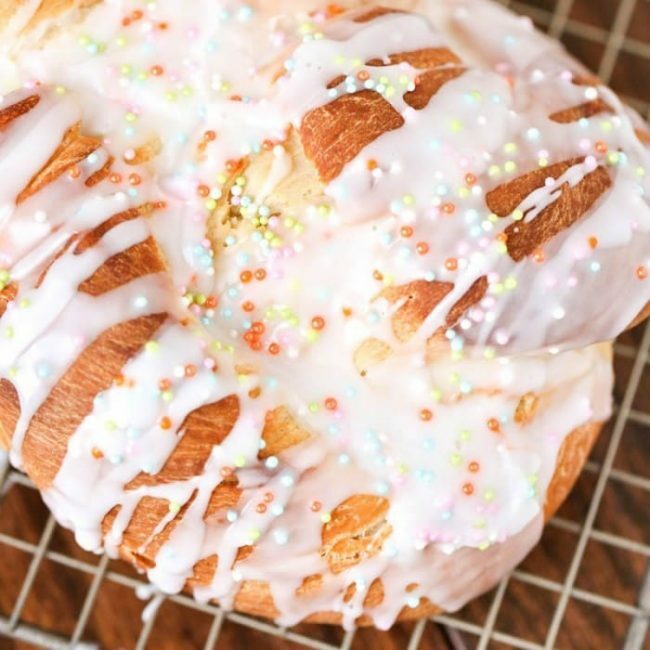 While your Easter bread is cooling, make the icing glaze by whisking milk and powdered sugar together until you have a thick paste. Drizzle icing on bread, then top with sprinkles. Let the glaze harden for a few minutes, then serve. That’s it! So easy right. It will only take about 15 minutes of active prep time, the rest is just letting your dough rise and the bread bake. Easy-peasy! 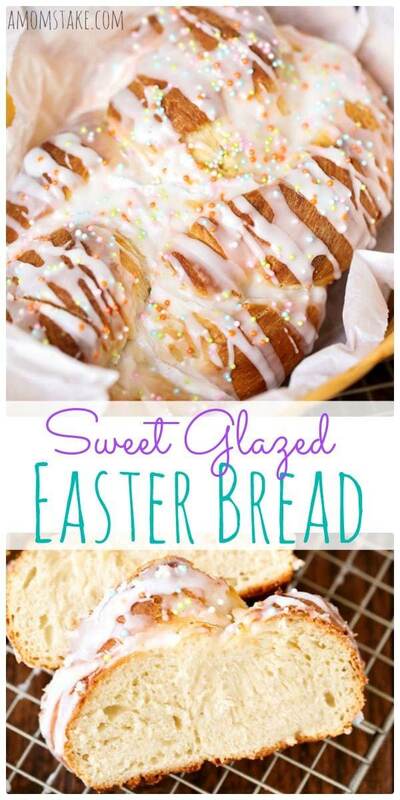 This sweet bread with a yummy glaze is going to be a big hit at your Easter festivities, or for any time of the year. Serve it alongside Easy Spiral Ham in the Crock pot for an Easter meal that’s never been easier! Mix milk and yeast in a bowl, let sit for five minutes. 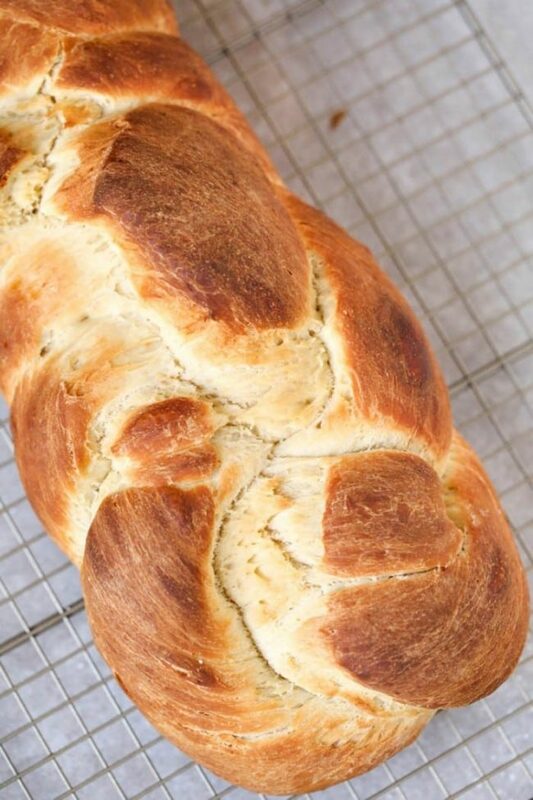 While your Easter bread is cooling, make the icing glaze by whisking milk and sugar together until you have a thick paste. We love sharing fun recipes for the holidays! Here’s a few of our other favorite Easter recipes. Be sure to stick around! Plus, a so fun Printable Easter Egg Hunt Checklist to add a fun twist to your traditional egg hunt! We hope you loved this recipe idea! Click the image below to save it to pinterest so it’s easy to find later! I just tried to make but my dough was very sticky? I tried to knead to but still remained sticky. Did I not mix it long enough or maybe needed more flour? Will have to try again. This looks so good1 I will be making this for Easter! Thanks for the recipe! This sounds really good. I like breads like this. I remember my Mother would bake colored eggs in hers. Have a great Easter! I remember having the Easter Bread at my Grandmother’s home. I really like the Hidden Carrot Cupcakes. I am going to make these with the girls. That looks delicious! My kids would love to wake up to that on Easter morning! 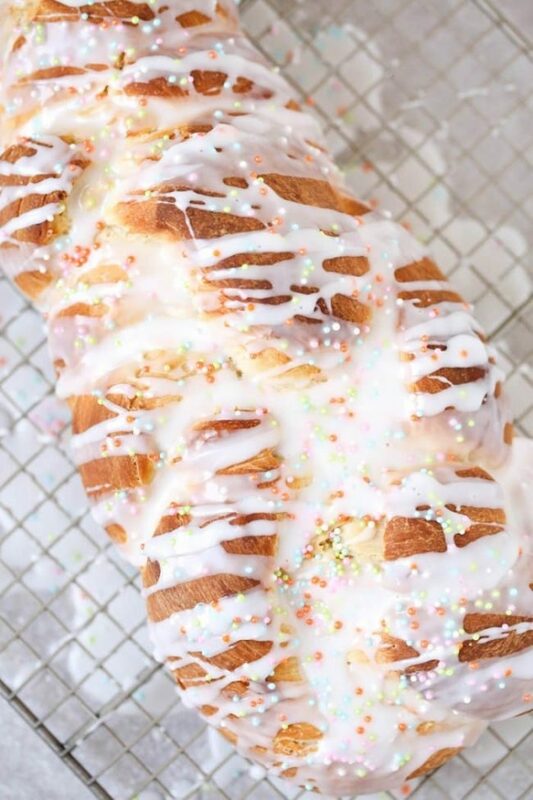 This Easter bread looks so delicious and would go great with my Easter dinner. This is my favorite Holiday of the year. Love the printable too! That looks delicious and you make it seem so easy, a perfect addition to our Easter meal. That bread looks like a great addition to our Easter menu. The kids get tons of candy, but this sweet treat is just what I want for myself. Whenever I make bread, I’ve always had to have warm milk or water. It’s always helped the bread rise and it doesn’t take forever. I’ll have to give your recipe a try for our Easter festivities! I didn’t warm the milk before hand, but some people do. It rises best in warm conditions, which is why I had a note about sitting in a warm spot. Hope that helps! Looking forward to becoming part of your group and trying your great looking recipes. If you keep the reciprocated I probably could try it this weekend. Saw a whole by chance of others delicious.